This document is included in Estimate Pack which is only available as part of the Proposal Kit Professional bundle. Order and download for $199. 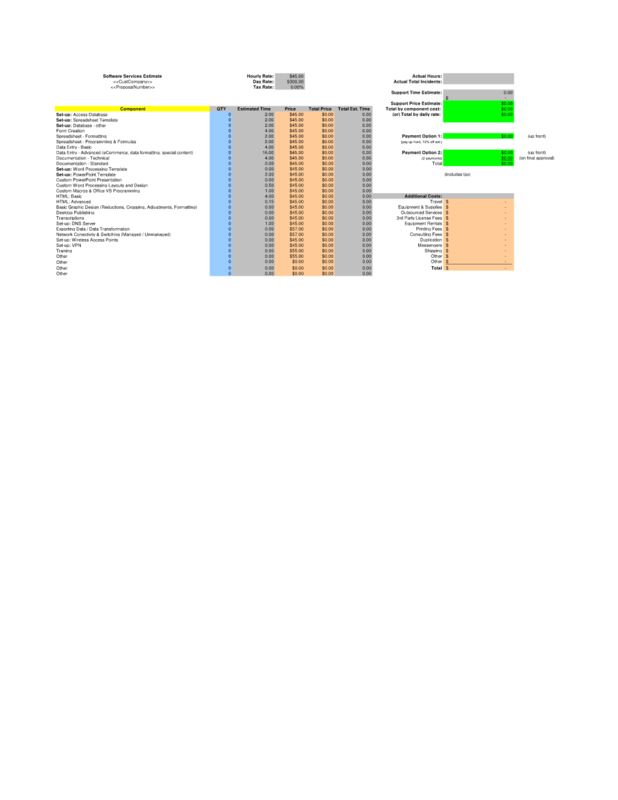 This spreadsheet is used to calculate the estimate for a computer software services project. on the Estimate Pack for providing comprehensive bids and breakdowns for each potential customer." The actual document is delivered in the retail products as an editable template. Related documents may be used in conjunction with this document depending on your situation. Many related documents are intended for use as part of a project management system. The Estimate Pack suite of templates compliments the proposal and contract documents by giving you a collection of project estimating spreadsheets to be used to help estimate the time requirements and costs of a project. A wide variety of documents are included and are intended to be picked based on your needs. All projects are different and have different needs and goals. Pick the collection of documents from our collection and use them as needed for your project. Recommendations and samples provided are only intended as general guidelines. The editable Software Services Estimate Spreadsheet - complete with the actual formatting and layout is available in the retail Proposal Kit Professional.